Day 22, the game closet at the end off the hall. 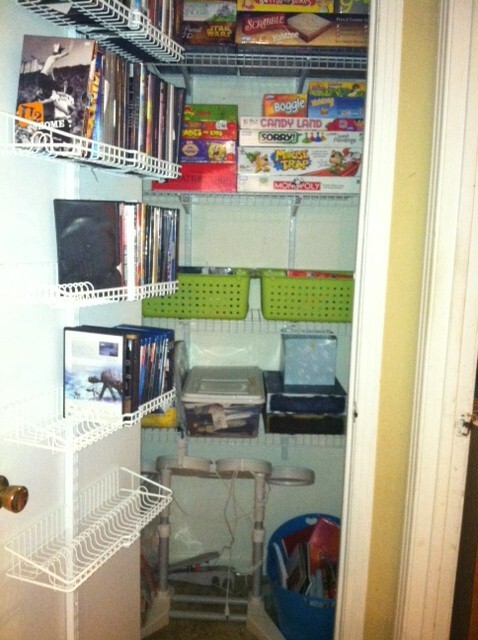 I also store notebooks, gift bags, movies, and photographs in this closet. It's really a lot for such a small space. Oh, did I also mention it stores the Wii drum kit? I did the best I could with the supplies I had in this space. I did weed out a few older games for donation which freed up a little space. The drum kit stayed put, because there really is nowhere else for it to call home. 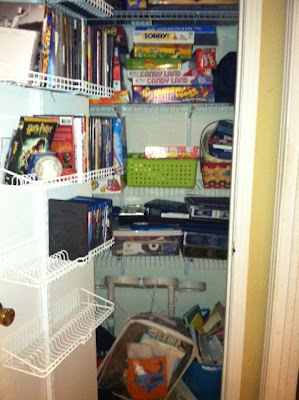 I found a matching basket to the one already in the closet to throw all the box set movies and computer games in. The one already there holds travel games, cards, and smaller game items. I also used a plastic bag with a zipper that sheets came in to store some photographs in, and another larger quilt bag for gift bags and tissue paper. It's not pretty, but it is a bit more organized.